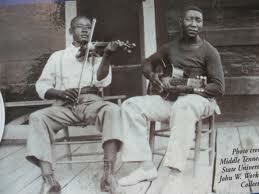 William Faulkner meets Muddy Waters . . . It was back in 1950, Faulkner was en route to Stockholm to accept the Nobel Prize when other business brought him to Chicago. A friend took him to the South Side where Waters was playing his blues. Faulkner watched him perform and then Waters was brought to the table and introductions were made. WF: I understand you’re from Mississippi. I live in Oxford, Lafayette County. MW: I was born down in Rolling Fork, Sharkey County, but I come up being a man near Clarksdale, Coahoma County. WF: How long have you lived in Chicago? MW: I come up in ’42, after the war started. WF: Ever think of going back? MW: Not for a minute. I got a lot of things out of Mississippi, but the bestest thing that I got out of there was me. Say, looka here, can I get you something to drink? WF: Nothing for me. What’s that you’re drinking? MW: Well, I like whiskey most of the year but come summer, I got to go off the hard stuff and get me something lighter. WF: So you switch to gin? MW: Naw, maybe just a beer. It gets so closed up hot around here in August, I got to go for a light one. WF: Hmm, a light in August? I’ll have to give that some thought. MW: The fellow that brought you said you getting some prize for doin’ books. Where do you do your writin’? WF: I just go back to Rowan Oak. MW: Back to rowin’ what? Man, that’s a hard wood. You should set yourself to rowin’ something soft, like pine. The oak will jus’ wear you down and you ain’t but a peckish lookin’ man from the start. WF: I enjoyed your song about being a hoochie coochie man. How exactly does someone go about becoming a hoochie coochie man? MW: Well, it’s best if you come by it in a na’chul way. Is you the seventh son of a seventh son? WF: Uh… no. Actually I come from a rather small family. MW: Was you born on the seventh hour of the seventh day of the seventh month? WF: No, my birthday is in September. MW: Well, it don’t matter that much anyway. Bein’ a hoochie coochie man is jus’ tellin’ people that they best not be messin’ around with you. If you go to thinkin’ that you the best book writin’ man in town, then you can go to tellin’ folks that you the hoochie coochie man at what you do. WF: I notice that this blues music that you do is melancholy in nature, but you don’t seem to be burdened. It apparently has a cathartic effect of purging the plight of your misery. MW: I don’t follow them words, but you right in sayin’ that singin’ the blues gets me to be feelin’ better. I put it all down in my songs. It’s a hard life and folks are always comin’ ’round and tryin’ to crush you spirit, but I don’t pay them no mind. As long as I can have some satisfaction comin’ to me, these blues will carry us on forever. WF: In other words, you’re saying that you decline to accept the end of men. MW: When times get hard, it’s singin’ the blues that gets you on by the worst part. But it ain’t enough to let your mind stay in one place. You got to feel that you can come up on your troubles and then move on down the road to somethin’ better. WF: You mean that man will not merely endure, but that he will prevail. MW: The blues come from hard times, and I sure come from a long line of that. There ain’t never going’ to be a time when blues is done. Folks always got bad times at their door and they’ll be blues singers comin’ along behind me forever. WF: Now I understand. The blues singer is immortal, not because he alone among creatures has an inexhaustible voice, but because he has a soul, a spirit capable of compassion and sacrifice and endurance. MW: Now you talkin’. Now you got them blues right! WF: Has anyone got a napkin? I’ve got to write this down.